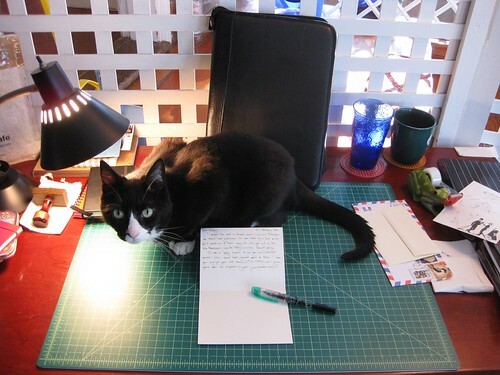 Here's a photo of Soda, Feline Postal Brigade charter member, "helping" with a letter. 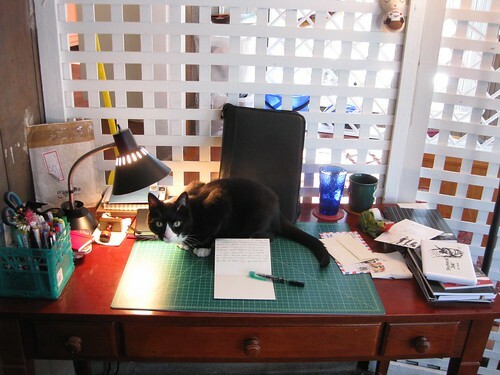 She has learned how to get up on my letter-writing desk, and now it's a free-for-all in kitty correspondence. I took these photos back in January, when Memo was still with us. I can't help but think that now, as I post them. We are taking so much comfort in our two remaining kitties, Soda and Magic, and I find myself wondering - are they really grieving for Memo as much as they seem to be (they are unquestionably confused by his absence), or are they just tuned into our grief, and staying close by to give and receive comfort? In any case, Magic and Soda and I have been thick as thieves the past few days, and I am so grateful for their presence and feline love. Soda has been sitting all over my letters on my writing desk (yes, I have been writing a few), and she is more than welcome. She is purring on the arm of the chair I'm sitting in, as I type this, and nuzzling my hand. The things they might do if they only had opposable thumbs. I think they miss Memo as much as you do, and additionally want to comfort you. - And probably they feel you are comforting them also when you are petting them. I'm so sorry about the loss of your kitty Memo... there are no words, I know. I'm thankful for you that you have other kitties to keep you company and to distract you, even if it's only for a moment. All my best, Kathy. First thing I bought in Amsterdam? Paper!